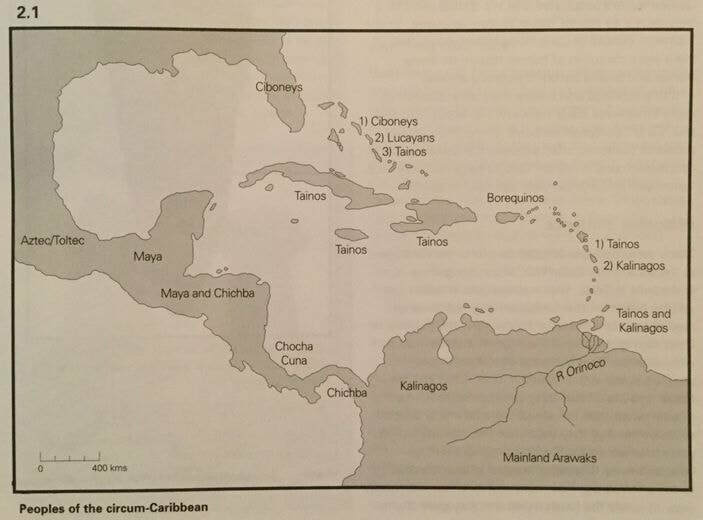 Before the arrival of Christopher Columbus in 1492, most of the Caribbean was occupied by three groups, of inhabitants: the Ciboney, the Taino or Arawak, and the Caribs. The cultural distinctions among the three groups are not great; the single greatest differentiating factor is probably their respective dates of arrival in the region. The Ciboney seem to have arrived first and were found in parts of Cuba and the Bahamas. They also seem to have had the most elementary forms of social organization. The most numerous groups were the Arawaks, who resided in most of the Greater Antilles--Cuba, Jamaica, Hispaniola (presently, Haiti and the Dominican Republic), and Puerto Rico. The smaller eastern island chain was the home of the Caribs, a tropical forest group related to most of the indigenous Indians found in Central and South America. Barbados and a number of smaller islands were not permanently inhabited. The Arawaks lived in theocratic kingdoms, with a hierarchically arranged pantheon of gods, called zemis, and village chiefs, or caciques. The zemis were represented by icons of wood, stone, bones, and human remains. Arawaks believed that being in the good graces of their zemis protected them from disease, hurricanes, or disaster in war. They therefore served cassava (manioc) bread as well as beverages and tobacco to their zemis as propitiatory offerings. The Arawaks painted their bodies in bright colors, and some wore small ornaments of gold and shells in their noses, around their necks, or hanging from their ears. Body-painting was also employed to intimidate opponents in warfare. Arawak villagers produced about two crops per year of manioc, maize, potatoes, peanuts, peppers, beans, and arrowroot. Cultivation was by the slash-and-burn method common throughout the Middle Americas, with the cultivated area's being abandoned after the harvest. The Indians worked the soil with sticks, called coas, and built earthen mounds in which they planted their crops. They might also have used fertilizers of ash, composted material, and feces to boost productivity. There is even evidence of simple irrigation in parts of southwestern Hispaniola. Hunting and fishing were major activities. Arawaks hunted ducks, geese, parrots, iguanas, small rodents, and giant tree sloths. Parrots and a species of mute dog were domesticated. Most fishing, done by hand along the coast and in rivers, was for molluscs, lobsters, and turtles. Bigger fish were caught with baskets, spears, hooks, and nets. In some cases, fish were caught by attaching the hooks of sharpened sticks to a small sucking fish, called a remora, which fastened itself to larger fish such as sharks and turtles. Food was prepared by baking on stones or barbecuing over an open fire, using peppers, herbs, and spices lavishly for both flavor and preservation. In some places, beer was brewed from maize. The descriptions of the first Europeans indicated that the food supply was sufficient and in general the inhabitants were well fed--until the increased demand of the new immigrants and the dislocation created by their imported animals created famine. The Caribs of the eastern islands were a highly mobile group; they possessed canoes similar to those of the Arawaks, but they employed them for more warlike pursuits. Their social organization appeared to be simpler than that of the Arawaks. They had no elaborate ceremonial ball courts like those found on the larger islands, but their small, wooden, frame houses surrounded a central fireplace that might have served as a ceremonial center. Many of their cultural artifacts--especially those recovered in Trinidad-- resemble those of the Arawaks. This might be explained in part by the Carib practice of capturing Arawak women as brides, who then could have socialized the children along Arawak lines. The social and political organization of Carib society reflected both their military inclination and their mobile status. Villages were small, often consisting of members of an extended family. The leader of the village, most often the head of the family, supervised the food-gathering activities, principally fishing, done by the men, and cultivation, a task for the women. In addition, the leader settled internal disputes and led raids against neighboring groups. The purpose of these raids was to obtain wives for the younger males of the village. ​Warfare was an important activity for Carib males, and before the arrival of the Spanish they had a justified reputation as the most feared warriors of the Caribbean. Using bows, poisoned arrows, javelins and clubs, the Caribs attacked in long canoes, capturing Arawak women and, according to Arawak informants, ritualistically cooking and eating some male captives. There are, however, no records of Caribs eating humans after the advent of the Europeans, thus casting doubts on the Arawak tales. The Caribs and the Arawaks were progressively wiped out by the after-effects of the conquest, with the peaceful Arawaks suffering the greater catastrophe. The concentrated populations on Hispaniola, Cuba, Puerto Rico, and Jamaica declined rapidly, victims of enslavement, social dislocation, and unfamiliar epidemic diseases. The smaller, more scattered populations of the smaller eastern Caribbean islands survived much better physically and epidemiologically. In the seventeenth century, the Caribs resisted European settlements on Dominica, St. Lucia, and St. Vincent, destroying the first English colony on St. Lucia in 1641 and delaying the effective occupation of Dominica and St. Vincent until the middle of the eighteenth century. Some Caribs resisted assimilation or acculturation by the Europeans, and a few of their descendants still live on a reservation in Dominica. Both the Caribs and Arawaks left indelible influences on the languages, diet, and ways of life of the twentieth century people who live in the region. Caribbean food crops, such as peanuts, cashew nuts, potatoes, tomatoes, pineapples, pumpkins, manioc, and maize, have spread around the world. The Indians' habit of smoking tobacco has become widespread, and tobacco has become an important commercial commodity. Arawakan and Cariban words have permeated the languages of the region: words such as agouti, avocado, barbecue, bohio (a peasant hut), buccaneer, calpulli (an urban zone), caney (a thatched hut), canoe, cannibal, cassava, cay, conuco (a cultivated area), quaqua (a bus or truck), quajiro (a peasant), guava, hammock, hurricane, iguana, maize, manatee, and zemi (an icon). The Impact of the ConquestThe Europeans who invaded and conquered the Caribbean terminated the internally cohesive world of the native peoples and subordinated the region and the peoples to the events of a wider world in which their fortunes were linked with those of Africa, Europe, and the Americas. The Caribbean peoples were devastated by new epidemic diseases, such as measles, smallpox, malaria, and dysentery, introduced by the Europeans and the Africans imported as slaves. Their social and political organizations were restructured in the name of Christianity. Their simple lives were regimented by slavery and the demands of profit-oriented, commercial-minded Europeans. Above all, they were slowly inundated culturally and demographically by the stream of new immigrants in the years immediately after the conquest. Sandra W. Meditz and Dennis M. Hanratty, editors. Caribbean Islands: A Country Study. Washington: GPO for the Library of Congress, 1987. A link to the full text can be found here.